Summers are an ideal time to lose weight. Make these detox waters to aide quick fat burn. Detox waters are great additions to your weight loss summer diet. Cinnamon boosts metabolism & apple cider vinegar keeps skin healthy. Oranges are rich in vitamin C, which burns fat to produce energy. Summers are an ideal time to lose weight. We tend to eat less and sweat more, leading to a general tendency to shed those kilos faster. The season demands for a proper diet, which maintains a steady supply of essential nutrients to the body, so that you can lose weight in a healthy way. Moreover, keeping hydrated is extremely essential. Sipping on water, coconut water, lemon juice and other hydrating drinks is crucial to keeping healthy and hearty during the summers. This is because you need to recover the electrolytes that get lost through your sweat. So if you're someone looking to lose weight and cut body fat this summer, detox waters may be great additions to your summer diet. You may want to prepare a stock of these refreshing fruit and vegetable infused waters in advance, to carry them with you when you step out in the heat. Lemon is the most used fruit during summers. It's extensively used in summer coolers and traditional health drinks in India and around the world. Lemon boosts weight loss and also helps in rejuvenating your skin. 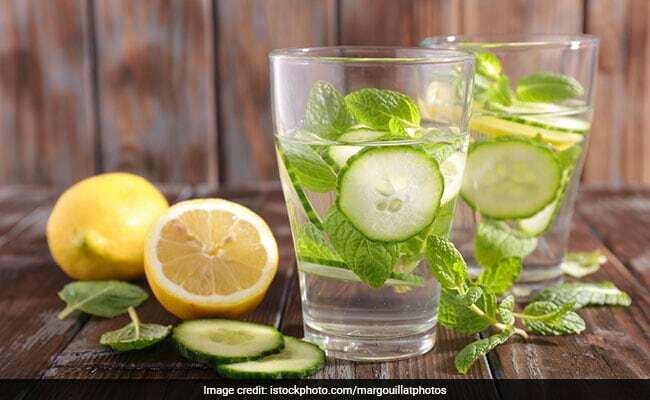 Add a few leaves of mint of pudina to the mix and you have a winner of a detox drink that cools you down naturally, aides in weight loss, maintains digestive health and keeps you hydrated. Grapefruit may be one of the best fat burning fruits out there. When eaten before your meals, this citrus fruit may help you in losing weight. It's incredibly nutritious too. Add a few pieces of grapefruit to your infused waters to increase their fat burning capacity and make them naturally sweeter.